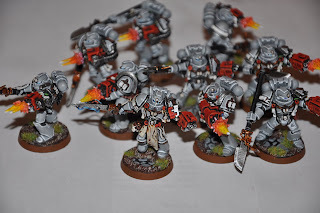 I've finally started to reinforce the Grey Knight Terminator squad. 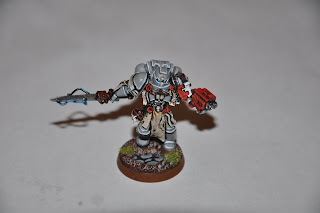 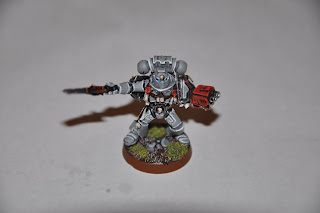 This is the first of 3 Grey Knights in Power armour squads that I'm painting up. 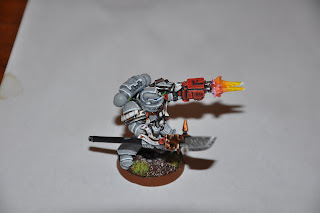 I used armorcast's cinematic effects (muzzle flashes) and some wire on the Justicar's nemesis force weapon to give the squad a more dynamic look. 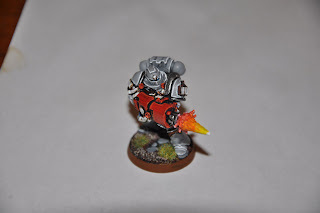 The paint scheme is very simple: armour is fortress grey, codex grey, skull white and the red is red gore, blood red and blazing orange. 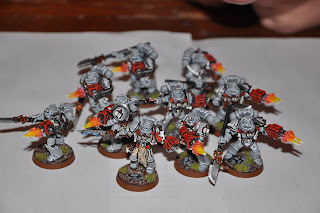 I'm going to take a break from the Grey Knights while I polish up the few remaining bits of Imperial Guard I need with the changes from the latest codex. 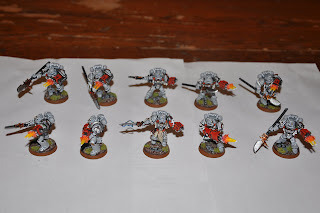 Watch this space for an update on the 411th Cadian Regiment!